Since forever I have been a huge fan of pancakes, waffles and French toast, I like to put them in the same category as they are all breakfast foods that I just cannot say no to. I can remember when I was a teenager being called 'weird' because I liked to eat my French toast with fried bacon and grilled banana all doused in maple syrup. 'Ew' they said 'sweet and savoury don't go together' they said. Was I ahead of my time? Yes. Or rather, I had taste like the Americans -who are well known for such "weird" concoctions as peanut butter and jelly (jam) and peanut butter and chocolate. I say they're geniuses! I'll take my bacon and smother it in maple syrup any day! 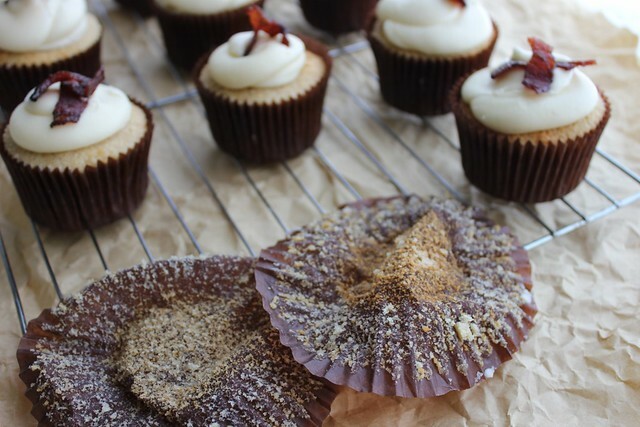 When I popped in to Miss Melicious to pick up my book and of course pick up a few cupcakes to eat, I asked Missy if I could re-create one of her cupcakes and share the recipe on my blog. I asked which recipe was okay to use and she just said "pick one!" Eeeeee! How exciting! So I took my book home and it was a tricky tricky choice, out of crazy cool flavours like watermelon and pumpkin pie I finally chose French Toast Cupcakes as I just knew I had to try them. 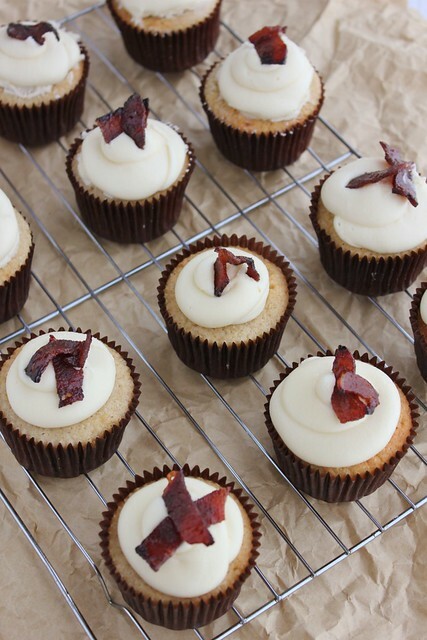 The recipe is easy to follow and I promise I am not sugar coating this but these cupcakes were perfect! 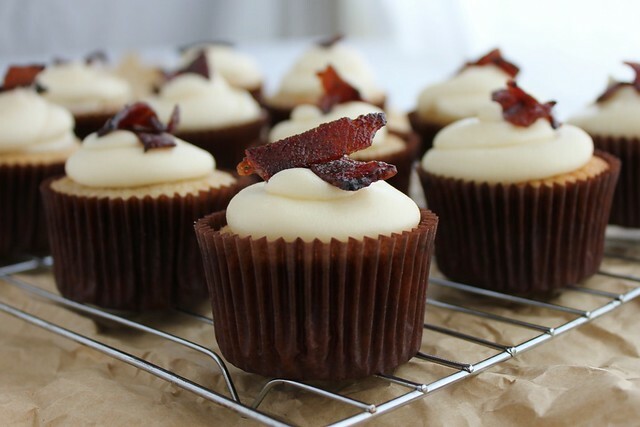 Soft fluffy cake, light airy sweet icing topped with sweet and salty bacon oozing with flavour. It may seem weird to you but my initial reaction when I try baking this good in my house is to find a way to get them out of my house. If I ate another one I knew there was no stopping me, soon I'd be the size of a house! I managed to get Mr S to take them to work and they were a hit there too! Sift the flour, baking powder, salt, nutmeg and cinnamon together, set aside. In a small bowl, combine milk and vanilla, set aside. Add egg yolks to butter mixture, one at a time, beating well after each addition. Add dry ingredients in thirds alternately with milk, beginning and ending with dry ingredients, beat until combined. Beat egg whites in a clean dry bowl until soft peaks form, fold into batter. Spoon mixture into cases approx. ¾ full and bake for 18-22 minutes or until skewer inserted comes out clean. 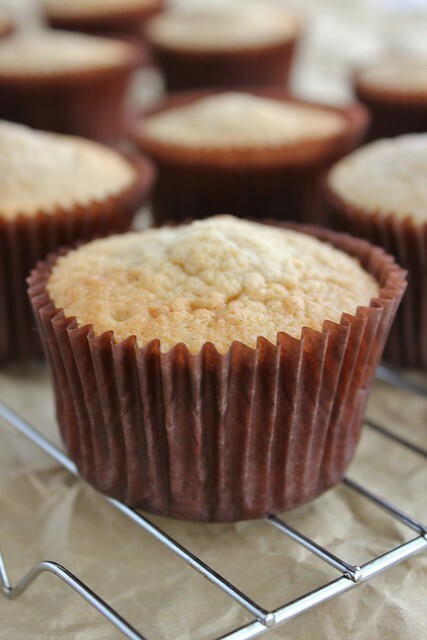 Leave cupcakes to cool in the tin for 5 minutes before placing on a cooling rack to cool completely. Sift icing sugar into a large bowl and gradually add to butter. Add milk and maple syrup until the desired consistency is reached. Add more milk if required. Beat for 3-5 minutes until light, fluffy and creamy, but still firm enough to pipe. Fill a piping bag fitted with a large round tip half way with buttercream and pipe large swirls on cupcakes, starting from the outside and working your way in. Line a rimmed baking tray with tin foil and place a wire cooling rack inside. Combine sugar and pepper. Add bacon strips and toss in mixture. 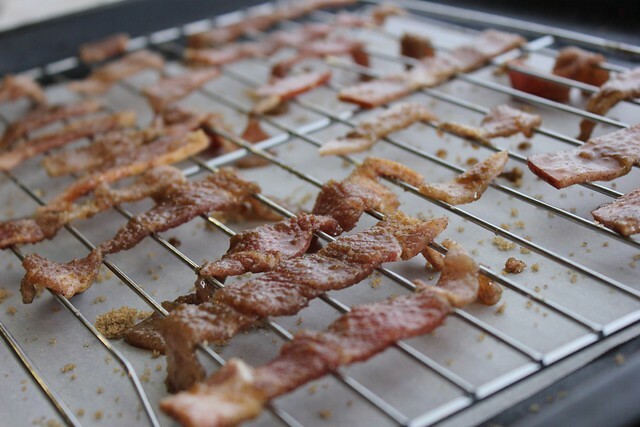 Lay strips of bacon on the wire rack in one layer and sprinkle with leftover sugar mixture. Bake for 25-30 minutes until browned. Cool before finely chopping and sprinkling on cupcakes. Awh thank you so much Mairi! They really do taste incredible. I had to get them out of the house FAST otherwise I'd be eating them all the time. I only ate one, now I'm wishing I stashed a few aside! 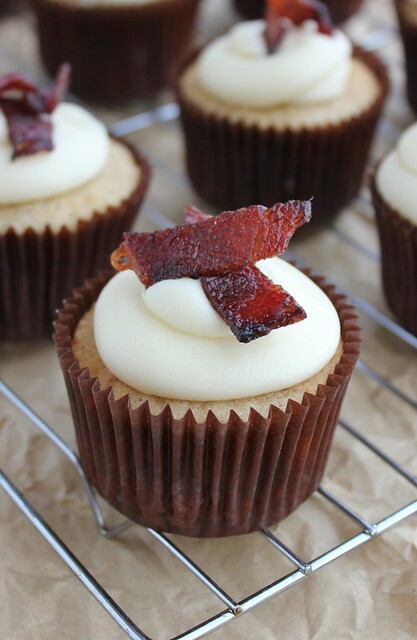 These look so good, I love breakfast food favorite meal of the day so I cant wait to try these. I made Miss Melicious strawberry shortcake cupcakes over the weekend, im just loving her book. What do you plan on making next from her book? Thanks Kara! How was the Strawberry Shortcake recipe? I'm not sure which one to try next! Maybe Beet Box? I'm very intrigued! They all look good! Thanks Benz! They are so delicious! 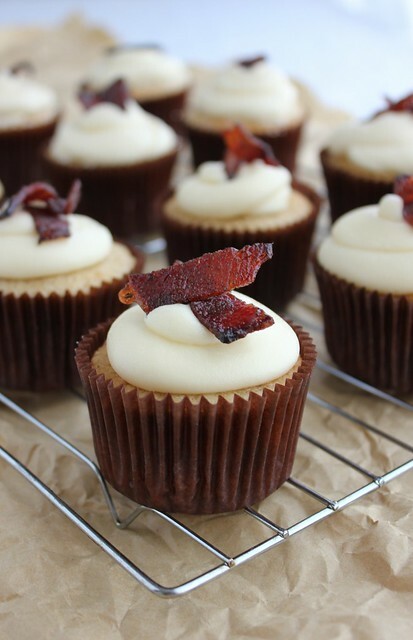 These look so scrumptious!! I love french toast, can't wait to try out this recipe. Thanks Mina! I do love me some French toast, I think I'll make some again some time soon too!